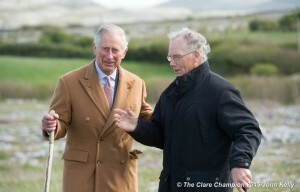 Charles Prince of Wales, is introduced to Oliver Nagle, by his dad Pat Nagle, the landowner, during his visit to the Burren in County Clare as part of his four day trip to Ireland. Photograph by John Kelly. 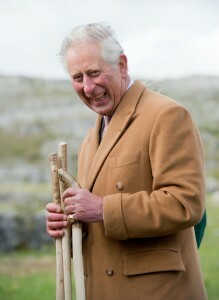 Burren farmers are a breed apart; a fact the Prince of Wales learned for himself during his jovial visit to the area on Tuesday. The heir to the British throne visited the lands of father-and-son farmers, Pat and Oliver Nagle, at Pullaghcarron and while there, tried his hand at the unusual form of dry stone walling undertaken in the Burren. It involves standing the stone upright rather than laying them flat. His Royal Highness needs more practice if he is to become as adept as Oliver and Pat, who have been upgrading the walls on their farm for the past five years, as part of the Burren Life Farming for Conservation Programme. Richard might be right. Tuition was brief before Prince Charles laid a flat stone on one of the walls in the blustery Burren. As Oliver explained though, the high wind is the reason they stand the stones upright, allowing it to go through the walls rather than knocking them. According to Oliver, “He loved it, he loved the fact that he got to participate”. So impressed was Prince Charles, the patron of the British National Hedgelaying Society, by the skills of Pat and Oliver in delineating their holding, that he invited them to his estate at Highgrove to lay some hedgerow there. The pair declined, sure “we’re stone men”. “We invited him back,” Pat recalled afterwards, “but he said next time he’d like to have the farmers to see his farm”. The Corofin man drew parallels between the royals’ position and that of farmers. “The Prince is in succession and so are we, as farmers and that is what life in the Burren is about, handing it on to a younger crowd and especially people who have a grá for it. 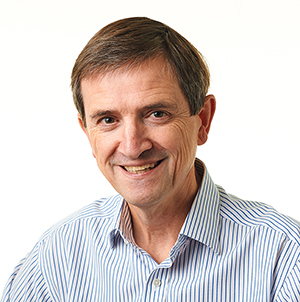 I am very lucky in that because [in Oliver] I have someone who I can hand it on to,” he explained, adding that in this regard, he felt a “a very basic connection” with Charles’ mother, Queen Elizabeth II. While at Pullaghcarron, the Prince of Wales also met Burren IFA’s Michael Davoren, who talked to him about the traditional royal links to the area. “We told him about the shorthorns. Traditionally the queen brought short horns from North Clare, they were direct ancestors of them cattle there,” Mr Davoren said, pointing at the livestock on the nearby meadow. 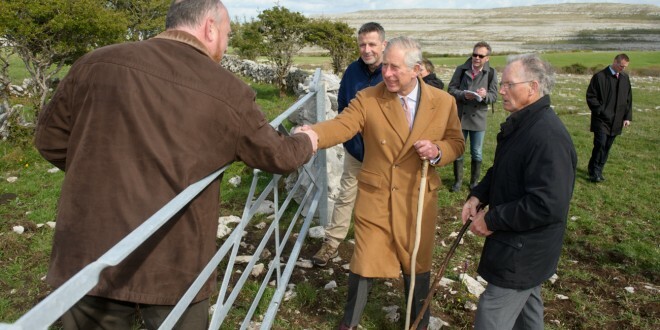 Charles Prince of Wales, is briefed on Burren farming by Pat Nagle, Landowner, during his visit to the Burren in County Clare as part of his four day trip to Ireland. Photograph by John Kelly. Pat Nagle said he was disappointed that the Prince couldn’t visit in 2002 as scheduled but noted, “This is a dream come true, for the entire Burren and particularly for the farming people”. Prince Charles has cultivated an interest in farming and conservation over the years and his knowledge was tested as he chatted with Pat, an expert in both. “He knew about the stock, he knew about the grazing, he knew about all of it. You just wouldn’t pull the wool over his eyes,” Pat revealed. Pat, Oliver and Michael presented the Prince with a hamper of locally-produced, artisan foods, including honey from beehives across the road from the Nagle farm. They had given him a hazel walking stick when he arrived, to keep him sure-footed on his hike across the clints and grikes but just before he departed, they presented him with three more: one for his wife, Camilla; one each for his sons, William and Harry. Charles further endeared himself to the local men when he called out on leaving “May the cattle prices keep on rising”, to the raised eyebrows and smiles of members of the entourage, themselves consumers.